Director – Jimmy Hayward, Screenplay – Neveldine & Taylor, Story – William Farmer, Neveldine & Taylor, Based on the DC Comic-Book Created by John Albano & Tony Dezuniga, Producers – Akiva Goldsman & Andrew Lazar, Photography – Mitchell Amundsen, Music – Marco Beltrami & Mastodon, Visual Effects Supervisor – Ariel Velasco Shaw, Visual Effects – [Hy*drau*lx] (Supervisor – Chris Wells), Pixel Magic, Rodeo FX, Soda VFX, Soho VFX Toronto, Special Effects Supervisor – David Waine, Makeup Effects – Christian Tinsley’s Tinsley Studio (Supervisor – Christian Tinsley), Production Design – Tom Meyer. Production Company – Warner Brothers/Legendary Pictures/Weed Road Pictures/Mad Chance/DC Comics. The 1870s. Jonah Hex is a former Confederate soldier turned bounty hunter. Captured by Union general Quentin Turnbull, Jonah was made to watch as Turnbull burned his wife and son alive in vengeance for Jonah having killed his family. Turnbull branded Jonah’s face and left him to die on a cross, however Jonah was saved and brought back to life by the Crow Indians. This has left him with uncanny supernatural powers. Though Jonah is regarded as a wanted outlaw, President Ulysses S. Grant orders him recruited following news that Turnbull is no longer dead as believed. Jonah follows Turnbull’s trail, eventually discovering that he has hijacked a weapon of immense power capable of destroying entire nations and is intending to fire it on Washington during the Presidential address. As he sets out to stop this, Turnbull abducts the prostitute Lilah, the one person that Jonah cares about. One of the great disappointments of the 00s has been how DC Comics have failed to catch up with the massive success that Marvel Comics have been enjoying on the big screen – see the likes of Blade (1998), X-Men (2000), Spider-Man (2002), Daredevil (2003), Hulk (2003), The Punisher (2004), Elektra (2005), Fantastic Four (2005), Ghost Rider (2007), Iron Man (2008), Captain America: The First Avenger (2011), Thor (2011), The Avengers (2012), Guardians of the Galaxy (2014), Ant-Man (2015), Deadpool (2016), Doctor Strange (2016), Black Panther (2018), Venom (2018), Captain Marvel (2019) and sequels to most of these. DC have certainly seen high-profile adaptations such as Batman Begins (2005), Superman Returns (2006), The Dark Knight (2008) and Man of Steel (2013) during this era – we will try and forget about Catwoman (2004). On the other hand, this is a pitiful handful compared to the runaway successes enjoyed by Marvel, most of which are now heading into second, third, even fourth and fifth sequels. A number of DC-based projects were mooted throughout the 2000s – with promised adaptations of The Flash, Shazam, Wonder Woman, Justice League – but these have remained in perpetual limbo throughout the decade with the only one of these to come near a greenlight being Green Lantern (2011), which went into production just as the decade ended, and followed by an aborted live-action Wonder Woman tv pilot and then in the mid-2010s the Zack Snyder-headed adaptations Man of Steel, Batman V Superman: Dawn of Justice (2016), Suicide Squad (2016), Wonder Woman (2017), Justice League (2017) and Aquaman (2018), all to very mixed (generally negative) reception. The only other DC adaptations to make it to the screen have been distaff ones that stand outside their regular canon – Constantine (2005), Watchmen (2009) and Jonah Hex here. Certainly, DC have enjoyed popularity on the small screen with the ongoing tv series Smallville (2001-11), Arrow (2012– ), The Flash (2014– ), Supergirl (2015– ), Krypton (2018– ) and Titans (2018– ) and the continuing success enjoyed by the various Batman, Superman and Justice League animated films and tv series from Bruce W. Timm. However, this disappoints considerably in comparison to Marvel’s runaway success story. Jonah Hex is one of DC’s minor comic-books. The character first appeared in All-Star Western #10 in 1972 and gained enough of a popularity that he soon became the lead character in the comic-book, which was renamed Weird West Tales a few months later, before gaining his own title Jonah Hex, which ran from 1977 to 1985. Jonah Hex was less a superhero comic-book in the recognized sense than something that fell between the Western Gothic of a film like Clint Eastwood’s High Plains Drifter (1973) and a dark avenger such as Batman and Marvel’s The Punisher. Fantasy elements, despite their prominent premising in this film, were only sporadic. 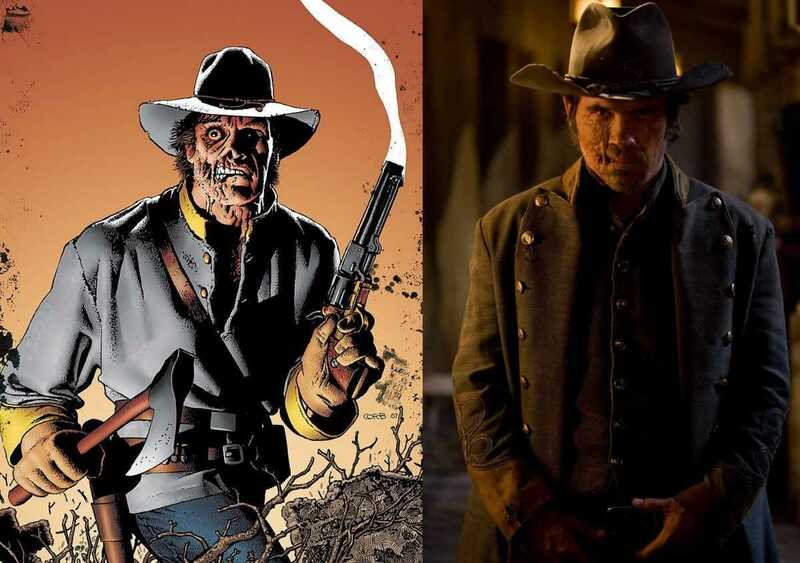 Jonah Hex’s origin story is different to the one in the film where he receives the scarring on his face (the Mark of the Demon) due to his dishonourable killing of the son of the chief of the Indian tribe that adopted him. Subsequently, Jonah Hex was revived in Hex (1985-7), a less popular series where he was transported to a post-holocaust future and continued to act as a bounty hunter. Jonah Hex has been sporadically revived in various short graphic novel runs since and has made guest appearances alongside other DC superheroes, including everybody from Green Lantern, Swamp Thing, Justice League and the Legion of Superheroes. Jonah Hex has appeared on the screen before in occasional animated episodes of Batman (1992-5), Justice League/Justice League Unlimited (2001-6) and Batman: The Brave and the Bold (2008-11), and was later played by Johnathon Schaech in an episode of the tv series The Legends of Tomorrow (2016– ). I must admit that prior to sitting down to watch Jonah Hex, the line-up of creative talents involved left me cold. The film is co-produced by Akiva Goldsman who has laid a trail of devastation through genre material with his scripts for Batman Forever (1995), Batman & Robin (1997), Lost in Space (1998), Practical Magic (1998), I, Robot (2004), The Da Vinci Code (2006), I Am Legend (2007), Angels & Demons (2009), The Dark Tower (2017) and Rings (2017), and has also produced the less than inspiring likes of Deep Blue Sea (1999), Mindhunters (2004), Constantine, Hancock (2008) and the terrible tv mini-series adaptation of Arthur C. Clarke’s Childhood’s End (2015). The script is from the writing/directing team of Neveldine & Taylor who had previously made Crank (2006), Crank 2: High Voltage (2009) and Gamer (2009), material that seems focused around a maddening empty-headed blur of frenetically-shot action sequences and little else, as well as having signed on subsequently as directors of Marvel’s Ghost Rider: Spirit of Vengeance (2012) and Neveldine solo directing the exorcism film The Vatican Tapes (2015) and Taylor the mass insanity film Mom & Dad (2017). Director Jimmy Hayward is a total unknown, having previously worked as an animator at Pixar before co-directing Blue Sky Studios’ Horton Hears a Who! (2008) – Jonah Hex is his solo and live-action directorial debut. Amid this uncertain mix of creative names, actor Matt LeBlanc of Friends (1994-2004) fame for some reason also turns up credited as an executive producer. I wanted to like Jonah Hex and gave it every chance (despite it being one of the year’s biggest box-office flops) but in the end it emerges as a strictly middling film – neither bad, yet nothing that you are willing to grant much beyond a basic mediocrity. It has clearly had a decent budget thrown at it, which is evident in matters like effects, makeup effects and production design. There are some lavish scenery shots and worthy poses. It’s just that Jonah Hex never seems to easily fit around any of these as a comic-book adaptation. Maybe part of it is Jimmy Hayward’s lack of prior experience as a live-action director. There are scenes where we seen a train blown up, where we visit a wrestling arena with a seeming mutant snake-man, and numerous shootouts and explosions – but none of them seem inspired or have the audience cheering. Jonah Hex should have had the pyrotechnic lethality in its Western poses of something like Desperado (1995) or the grim ultra-violence of comic-book adaptations like Sin City (2005). The material is there but passes more as eye candy than with any kinetic or visceral charge. Jonah Hex also suffers the same problem that was endemic to one other DC adaptation of the 00s, Constantine, which was notedly also produced by Akiva Goldsman. And that is that it seems stuck at making comic-book poses – the rather absurd image of Josh Brolin on a horse mounted with massive Gatling Guns, or firing mini-crossbow guns that look like futuristic uzis – and fails to get inside the dark mood of the comic-book. To give Neveldine & Taylor credit, their script makes a fair attempt to delve into Jonah Hex’s backstory and provide him with motivation. However, I am not sure if Jimmy Hayward is so attuned. The character of Jonah Hex should have burned with a desolate emptiness and the dark psychological fury of the modern action hero. The film achieves this in sporadic moments – some of the background writing, a scene with Josh Brolin shooting a man in a saloon – but mostly doesn’t. Jonah Hex is also a film that would have gained immeasurably from being released with an R-rating rather than aiming for a PG-13, something that would have allowed it to far more readily tap into the grim violence of the comic-book than have to avoid showing any blood or look away when Josh Brolin is attempting to shove Michael Fassbender’s head into a propeller. Part of the problem is also Josh Brolin. Brolin seems to have drawn his inspiration from the same source that the comic-book originally did – Clint Eastwood’s Man With No Name – and gives an Eastwood-esque performance through clenched teeth and with dialogue kept to a grim minimum. On the other hand, Brolin also tempers the role with a laidback cockiness as though he is not taking it terribly seriously and fails to fully project anything of either Clint Eastwood’s flinty tautness or the singular grim intent of a modern action hero. The film tries to find something for last year’s no talent celebrity of the moment Megan Fox to do and provides her with a tough role that someone with half an ounce of acting ability would have eaten up. It is hard to tell if Megan Fox is making any effort – the character is so underdeveloped – and about the only thing you come away wondering is why she seems to have her facial features airbrushed in every shot she appears in. The great John Malkovich turns up in an underwritten role as the villain of the show but does little more than walk through the part. Jimmy Hayward next returned to animation with the bizarre Free Birds (2013) about time-travelling talking turkeys.